It’s easy enough to explain the growing popularity of Latin Fusion acts in California simply by looking at demographic trends; according to figures recently released by the governor’s office, Latinos are no longer a minority group as of March 2014, and presently account for 39 percent of California’s population overall, effectively making them an ethnic majority. As a musical genre, Latin Fusion has been a staple of the Bay Area sound since Santana’s 1969 debut album. But while Santana mixed psychedelic rock, R&B, and blues with Latin musical elements, things have changed since then, most notably the rise of hip-hop and its Espanol-speaking cousin reggaeton, as well as the onset of electronic music and EDM. 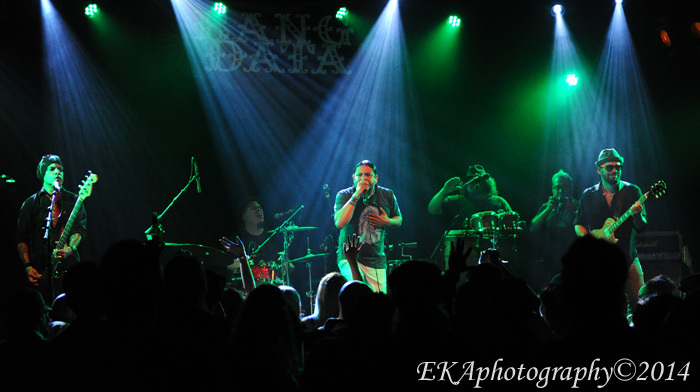 In 2014, Bang Data—a group best known for being featured during the infamous poison tequila scene in “Breaking Bad”—stands at the forefront of a new generation of Latin Fusion artists coming straight from the calles of Califas. As a band, Bang Data has been around since 2008. 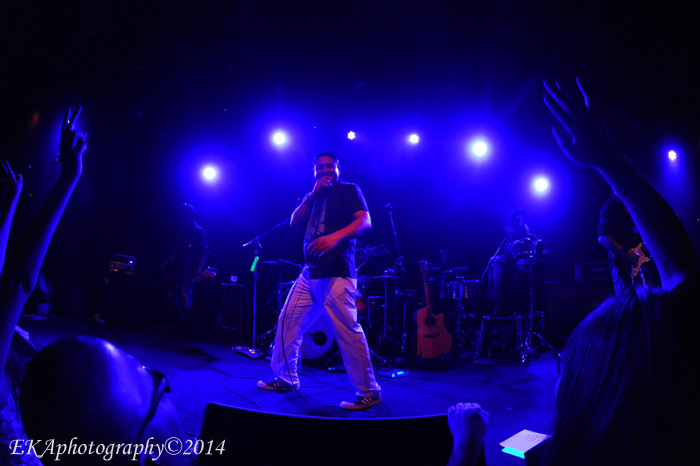 Originally a trio featuring bilingual vocalist-emcee Deuce Eclipse, guitarist Dave Lopez, and percussionist/producer Juan Manuel Caipo, their early material was a fairly straight-ahead mix of rock, rap, and traditional Latin rhythms. 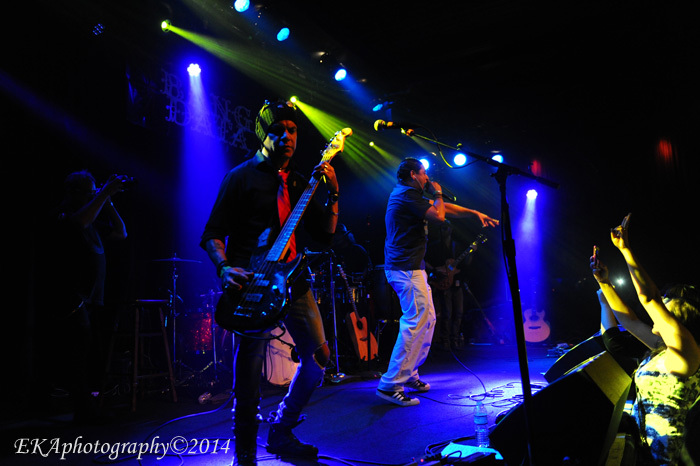 But after Lopez’ departure, they added bassist Marco Guzman and guitarist Michael Cavaseno and further evolved their sound, like an antojera might mash different ingredients into a flavorful salsa. Their title of their first full-length album, 2012’s La Sopa, was a reference to the soup-like qualities of their music, which takes a little from here, a little from there, and mixes it together into a spicy stylistic blend. With their second full-length release, Mucho Poco, Bang Data refine their style even further, aiming for an accessible (but not over-the-top commercial) sound which falls right in with the new wave of contemporary Latin Fusion acts in the Bay (a short list of which might include Alta California, La Gente, Locura—whose last album was also produced by Caipo—and Candelaria.) The album starts out on an upbeat note, with “Bailalo,” a club-ready banger whose lyrics namecheck Cesar Chavez and Emiliano Zapata. Mucho Poco’s first single “Amor Califas,” updates the 2Pac/Roger Troutman/Dr. Dre hit “California Love” with Spanish vocals, congas and turntable scratches. The song loses the vocoder vocals, adds “whoa-oh-oah” choruses, some incendiary guitar riffage, and a percussive breakdown section, yet retains the anthemic, party-friendly vibe of the original. It also shouts out the huelga bird of the United Farm Workers, along with California cities with notable Latino populations: Oakland, San Pancho, El Cerrito, Vallejo, San Diego, Fresno, Modesto, and Sacramento. With its instantly recognizable hook, yet unmistakably altered lyrical and musical content, it’s a good choice for the lead single, one which can resonate with urban audiences as well as native Spanish speakers. 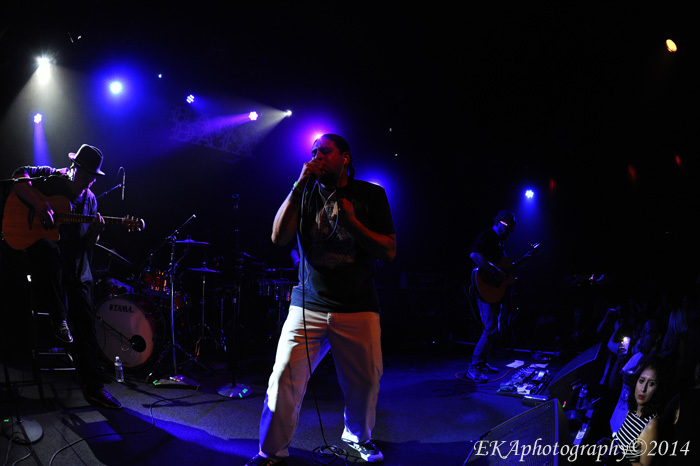 “Amor Califas” is followed by “Si Te Gusta,” an innovative track which can be described as “cumbiaton,” with an accordion-like synth and guest vocals by Alguacil and Binghi Fyah. The song features an English chorus for the gringos: if you feel the motion let us know/ We plant the seeds so they can grow/ We heal when you come to the show/ So here we go, here we go. “Candela,” the next song, chugs along at a fast tempo, accentuated by handclaps, more cumbia-style accordion melodies, various percussive instruments, and a trace of dubby, ska-inflected guitar. The song starts with Deuce rapping in English, then switches over to him singing in Spanish for the second verse. Despite, or maybe because of, all the ingredients in the mix, the song comes together well, standing as a highly-representative example of Bang Data’s talent and versatility. The album’s title track returns to the more minimalist-flavored songs of Bang Data’s earlier material. Deuce’s growing skills as a singer are highlighted over a track which is mainly acoustic guitars, a bit of female backing vocals and some light melodic shading. It’s a good change of pace after the busier, sonically-dense songs which preceded it. “Calavera Life,” sung and rapped entirely in English, aims for mainstreamish pop perfection, yet lacks the nuance of Bang Data’s more traditionally-influenced material. It’s easily Mucho Poco’s most contrived song, right down to the Miley Cyrus-like couplet, we don’t stop no no/ we on top fa sho. A saving grace is the remainder of the song’s lyrics (this life’s gonna be a better place/ and I’m a live it so I have a better face), which ring with positivity and inspiration. Bang Data are at their best when they’re firmly in their element and not trying too hard to be everything to everybody. That ends up being pretty much the case for the album’s last third, which finishes strongly. “Volar” (featuring Ozomatli’s Wil-Dog and Chico Trujillo) pushes ahead as a fairly straight-forward Latin rhythm with a rock edge, which easily bridges the traditional and the contemporary. So does “Tierra,” featuring guest vocalist Hector Guerra, which melds a slinky electro-cumbia feel over a sample of the Latin standard “Cancion y Huayno.” “Mal y Bien” is a future classic, pulling in mariachi guitars, field-laborer flute snippets, rapid-fire cadences and impassioned singing over a bouncy, electro-fied beat. The closer, “Suena,” again harks back to traditional field-hollers for its strident chorus, while Morricone-esque guitar adds a cinematic soundscape to Deuce’s bilingual slang-slanging. Categories: Album Review, Music Review | Tags: album review, Bang Data, California Love, cumbia, Deuce Eclipse, EKAphotography, Huelga bird, Latin Fusion, Mucho Puco, music review | Permalink.